Posted August 30th, 2017 by Mary Ann Hooper & filed under Past newsletters. After the business meeting, we will have our Bring and Share Social with finger foods/ drink that people bring, and a chance to network. (Although apparently there is a Festival event that some might want to go to). We have to be out of the Eco Centre by 9pm. Please come by bus if you can. a speaker to be announced. What can Gowirksworth.com do for Transition Wirksworth? We gave a donation to the development of the new website because we believed our efforts to build a sustainable local community in Wirksworth were hampered by not having a central hub for electronic information about the town. The website in Wirksworth has been live for about four months. Has it made a difference? It is beginning to but slowly, as people get to know it’s there and what it can do for us. Anyone can add an event using a form from a link on the Home page under Residents (you submit the form to be published). You can also find out about ongoing events and classes from the Residents page. Under About our Town click on Weekly Events, where you will find links to the calendars of the Leisure Centre, the Coach House Studios, Town Hall venues’ events, Town Council meetings and some other weekly and monthly events. Please tell people about it! Here are a few more useful items on the website. On the Home page, there is also a Menu at the top. Click on it to go directly to Visitors, Residents, Events, Business Directory, or About. Below the blue Menu is a very useful Search this site. On the Residents page, click on Community Groups and you will find details for about 75 local groups under a variety of categories, sometimes under more than one category (so guess if it isn’t obvious). On the Residents page, under Civic, click on Transport and you will find (near the top) a link to the county map of current roadworks. Check it before you head out! Transitioner Mary Ann Hooper is on the support group (of four people) for the website worker, Alice Munro, who is now paid for just five hours work a week, all the money available at this point. 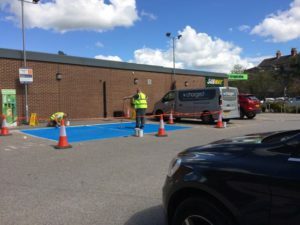 The electric car re-charging points are now installed at the Co-op, thanks to the initiative of our Recycling & Waste Group.